Today I went to Bondi Beach for a swim and some rays with my little man. It was the first international surfing competition to take place on Bondi Beach in over 20 years and a very gorgeus warm March Sunday, so it was, expectedly a busy day at Bondi. The water was superb, and I felt really blessed to live in such a lovely place, to have such freedoms and social tolerance in our community. Especially with all the tragedy and sadness around our world today. However, there’s been a feeling of emotional intensity in the last couple of weeks. Emotions have been running high for me and many others I know. Don’t know if there’s some metaphysical reason for this but in any case, I’ve been doing a lot of thinking about Bondi…the endless development that I see everywhere in my suburb, the turning of this suburb into a big tourist destination, the incessant changes to the buildings and businesses and the spiralling high cost of living here. I understand that Bondi has always been a tourist destination but it just seems to me that Waverley Council is concentrating its focus on the tourist and development dollar rather than looking after its residents. Last week there was a story in the Daily Telegraph about how Waverley’s mayor is asking taxpayers to help maintain Bondi Beach. The comments posted against this story are worth a read! I know that some people will see this as whingeing about Bondi. After all, I choose to live here. But I choose to live here because it is my home. It is where I grew up and where I want to raise my child. But what happens when you get pushed out of your home city or suburb because it becomes so unaffordable, so crowded and overly concerned with urban development, wealth and superficiality? You either leave, as many have done, to settle in other smaller and more affordable communities or you choose to stay. Well I have chosen to stay but lately I’ve been questioning this decision. How do you weigh up your emotional ties to a place versus the practical realities of life and the inevitability of change? Then comes the news of yet another devastating natural disaster to hit our planet causing more tragedy for so many people – the earthquake and tsunami in Japan. And it makes me realise that I really have very little to complain about…except, like many others, learning how to cope with potential forced displacement, in a world going insane! Although not a tourist-worthy destination, this same thing happened to my native San Pedro and Palos Verdes Peninsula. I must say I’m happy I left, but I’ve become a heartless pragmatist. Hey Christov10, I hear ya! Though surely with the “right” kind of buildings and landscaping, businesses and marketing, I think that the development-machine can turn just about any place into a tourist destination! That’s shame to hear about the San Pedro and Palos Verdes area having the same kind of fate. So do you recommend becoming a heartless pragmatist? are there any cons to consider? Well, of course the drawback to becoming a pragmatist is the wear and tear on one’s heart, which is why its suppression or removal altogether sometimes seems warranted. Truthfully, I don’t seriously ever “look back.” I have the most vivid memories from earliest childhood on, photographs, and having put down roots in another place, I have been more than compensated for the years the locusts ate. Apologies for frequent use of cliches in this reply. Well I think there’s a lot to be said to live a part of your life somewhere other than where you grew up. So many people I know have lived in another city or another part of the world to where they spent their childhood/teens and appear to have “moved on” after they’ve left their hometown. Maybe I’m just too much of a sentimentalist or nostalgia-head. In any case, I find it difficult being confronted with seeing so much of my hometown being changed – it’s like someone erasing your memories when you don’t want them to. The place I grew up is unrecognizable now. I never want to see again what it’s become. That’s harder for me than anything else. You know, I’ve watched silent movies and recognized locations and structures that were recognizable when I was a kid living living below Mesa Street in San Pedro. So much history and soul’s been bulldozed, paved over, and gentrified. I feel like some revenant from a lost world. So much better, for me, to move on and live in my present. Sorry to be such a downer – I do have strong feelings about “development” – I try not to feel them very often, though. I understand. It is a difficult thing to reconcile. I totally get that life is about change and that everything changes and that development of our suburbs, towns and cities is a kind of inevitability in our lives. But sometimes the pace of change is a bit too rapid! If Bondi is your home and you love it, do not leave! Once you leave (unless you are very wealthy) you will never be able to afford to move back. But not matter what you decide always remember ” you can take the girl out of Bondi but you can never take the Bondi out of the girl”. I left Bondi many years ago after I married. I would love to move back and always call it home, visiting often. I hear you Paula! I lived in the inner city for a little while a number of years ago and really missed being in Bondi and near the water. Yes I agree…as a close friend always said to me (particularly around that time of my life), “you can take the girl out of Bondi but you can’t take Bondi out of the girl!” It’s good that you get to visit often. Well, All of you that are younger than me.. The Whole thing needs to stop, not you guys but what has happened to our area that we grew up in. 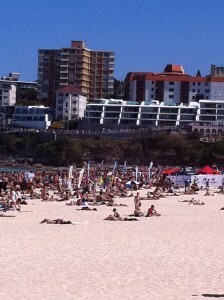 3) Stop these developments not only at the beach but areas within Bondi. Yes, I agree. I would love the 322 bus route to still run. I can’t understand why it was ever stopped. Surely it would be very well patronised these days. It is tricky to get from Bondi to Rose Bay if you don’t drive. Also I just realised what a great option it would be to avoid the gridlock of traffic for people wanting to go to Bondi on busy days. Cruise on a ferry then get a 322 to the beach! Re parking and rate payers…please don’t get me started here! But yes some kind of compensation for rate payers would be appreciated. Re developments – I think my feelings on this have been expressed elsewhere in this blog – let’s slow it all down a bit.